The way a datasource connects to a PivotTable depends on the datasource. In this post an overview of the six connection models that you can create by means of Excel’s userinterface. The figure below presents the six basic connection models between a PivotTable and it’s datasource. In fig 1 most dashed rectangles serve as caches, and are often invisible. 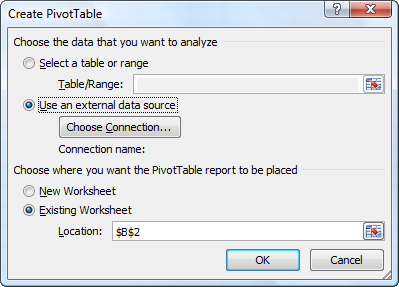 A PivotTable is never directly connected to a datasource. Every PivotTable gets its data from a PivotCache, an object that is automatically created when you add a PivotTable to a worksheet. PivotTables often share one PivotCache. When you create another PivotTable from the same datasource, Excel will usually connect the PivotTable to the existing PivotCache. This explains why a refresh of one PivotTable often refreshes other PivotTables as well. For details see the VBA help. Create a table on a worksheet, add some rows with data and/or formula’s, and create a PivotTable with the table as source. This is a typical model A, where PivotCache.SourceType = Database. In other model A situations SourceType is Consolidation or Scenario. A drawback of a model B connection is that data is cached twice. A benefit is that you can enrich the sourcedata in an easy way by means of calculated columns in the ListObject. An alternative for calculated columns is to import data by a SQL-command. For a model C connection follow the steps for model B, but in the dialogueue ‘Import Data’ (Fig 4) select the second option, ‘PivotTable Report’. A model B connection is efficient since data is not cached twice. A drawback is that you cannot easily enrich the sourcedata, as in model B. However, in a model C connection the PivotCache is able to import data by a SQL-command. Xml data are not cached but imported directly into the ListObject. When you import Xml-data an XmlMap object must be present or will be created. The XmlMap object knows if/where to map each element of the Xml-file schema. 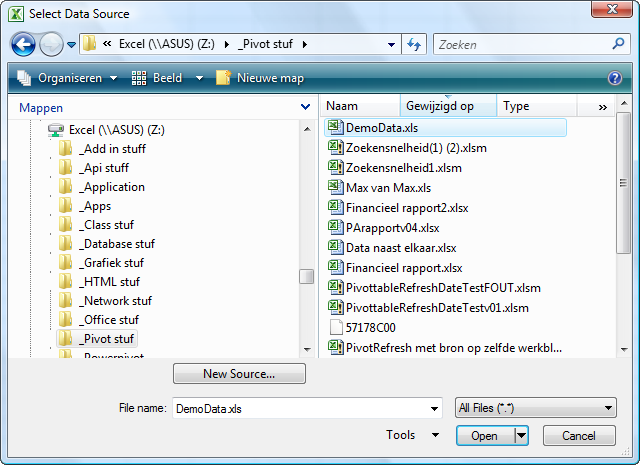 Data from an Xml-file can be mapped to one or more worksheets, to ListObjects and/or to single cells. The ListObject (of which property SourceType has value SrcXml) is sometimes called ‘Xml table’. Although the datamodel is ’embedded’ it behaves by all means as an external source, and indeed PivotCache.SourceType = External. 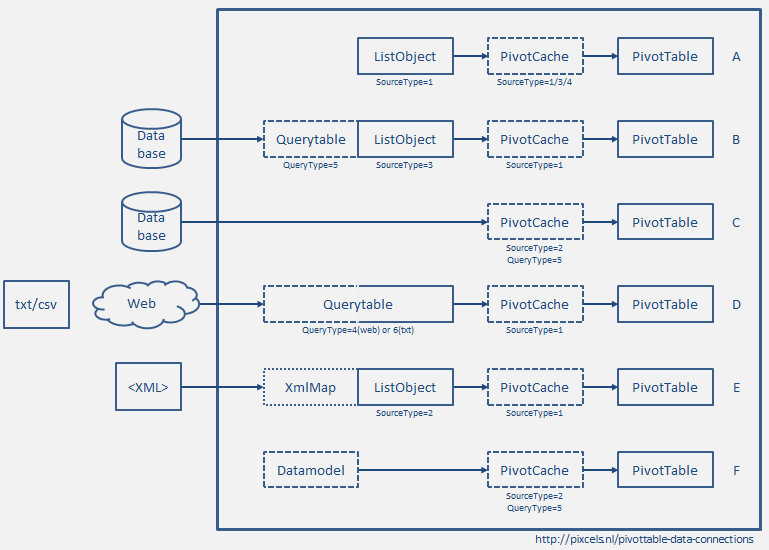 The datamodel is an SSAS OLAP cube: PivotCache.OLAP = True. Basically, a model F connection is the same as model C.
By means of Excel’s userinterface you can create connections from other sources as well. For example from a SQL Server table/query, or from a SSAS Cube. In most cases you will be able to choose between a model B or a model C connection. By using VBA many other connection models can be created, in which – for example – the QueryTable is replaced by a cache of your choice: an Ado recordset (connected to a database table or query), a Html DOM document (webquery), or an Xml DOM document (Xml-import). I hope this pixcel helps. Excel! I’ve verified that I’m working with Model F above, I have multiple PivotTables connected to a SSAS OLAP cube. I created these multiple PivotTables by starting with one PivotTable, then copying that PivotTable in the same worksheet and creating a new report. When I look at the PivotCache index for each PivotTable, it shows a separate PivotCache index for each of the PivotTables. 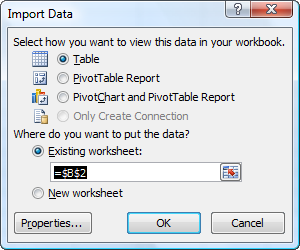 Do I need to refresh each PivotTable to ensure I have the latest information in each Pivot report, or can I just refresh one of the PivotTable reports and that will refresh the other reports? I can’t test this for this data source because I can’t alter the SSAS OLAP cube.